Failure to fix an oil leak that had been reported weeks earlier contributed to London's summer power cut, rail engineers have told the BBC. 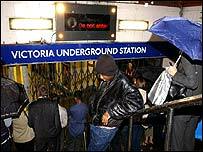 Thousands of passengers were left stranded during the evening rush hour by the blackout, which halted 1,800 trains and closed 60% of the Tube network. At the time, National Grid Transco said the shutdown had been caused by a unique combination of technical faults and denied any lapses in maintenance. However, a field engineer told the BBC the root cause of the incident was a leak that had been reported but had not been fixed for at least three weeks due to a lack of staff and poor maintenance. The BBC has also seen internal documents that talk of a "black-hole" of outstanding repairs and field staff having lost confidence in the planning system. The power cuts caused travel chaos in London on 28 August, leaving about 410,000 homes and businesses left without electricity. In its own report into the incident, the National Grid said a failed transformer at the Hurst substation near Bexley in Kent on 28 August, triggered the blackout. National Grid switched the transformer out of service at 1820 BST and power was re-routed through other circuits so it could still flow. But within seven seconds another fault occurred which stopped the flow of electricity on a 275,000-volt underground cable between the New Cross and Wimbledon substations. However, a field engineer, who wished to remain anonymous, disagreed with that conclusion. "The first fault was not a fault. It was a lack of oil in the shunt reactor," he told BBC Radio 4's Today programme. "That comes down to a lack of maintenance, a lack of staff in the planning system to make sure that initial flag that said we need to get this shunt reactor filled up didn't work." He said the oil leak had been reported three weeks before the blackout, but had not been fixed. "There are not sufficient staff to do the work. Work had been requested and sometimes in some instances it would take several days for that work to come through. "If that's urgent it's very, very difficult to keep things going," he said. Director of transmission for National Grid Transco, Nick Winsor, said the report was not misleading. "The report clearly says what exactly caused the power cut. "It was a 1 amp relay being installed when actually - to our great regret - we should have had a 5 amp," he told the Today programme. He said it was routine to switch equipment in this situation, and without the wrong relay being in place there would have been no power cut. "You could switch that equipment off and on the system all day long. If the right relay had been in place there would not have been a power cut." While he was aware there had been an oil leak registered weeks before the power cut, he said it was not an indication of poor maintenance that it had not been fixed. "We did know there was an oil leak, it had been registered and the oil had been topped up." "We take this issue extremely seriously and indeed our safety record speaks for itself. We improved safety by a factor of 10 since privatisation and doubled out performance in the past year." Asked about the alleged backlog of statutory checks on maintenance work, Mr Winsor said there was "a small backlog which we will have fixed by Christmas". "The engineer claims it was due to an oil leak"